The moment you start changing your eating habits by steering clear of processed foods, refined sugar and white flour, your taste buds begin to transform. Suddenly, overly salty or super sweet food does not do it for you anymore, and you automatically adjust the way you cook, like adding less sugar to cake batters because you know it will still be sweet enough… Anyone who has discovered the joy of dark chocolate will know what I mean. Milk chocolate will never again be your first choice. Every now and then, however, even I can appreciate the pleasure of a toe-curlingly sweet treat. After a long park run on a cold morning, or with a gorgeous cup of tea and your favourite book. It is for moments such as these that I usually keep a few of the buckwheat crispie bars in the freezer. They are crunchy and syrupy, and a honey bee’s dream. Whisk together the peanut butter, honey, coconut oil, salt, cinnamon, ginger and orange zest until well mixed. In a large bowl combine the oats, buckwheat, walnuts, apricots or cherries, and seeds. Ensure the apricot pieces are separated and coated in oats. buckwheat and / or seeds – use your fingers to do this. Pour the dry ingredients into the peanut butter mixture and stir well. Line a Swiss roll pan with greaseproof paper, allowing for an overhang on the long side of the tin. Spoon the mixture into the pan, pressing down firmly with the back of the spoon or your fingers until it is very tightly packed all the way into the corners. Now refrigerate the tray for at least 2 to 3 hours or place in the freezer for roughly 1 hour. 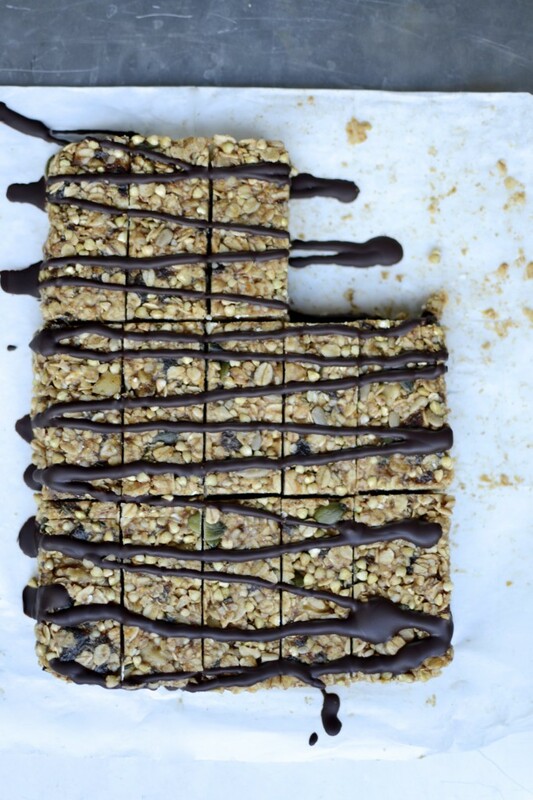 When firm, lift the granola mixture out of the tin and onto a chopping board by grabbing hold of the greaseproof paper. Cut the slab into small bars or squares. If you are using chocolate, place the sheet with the bars back in the Swiss roll tin. Spoon the melted, slightly cooled, chocolate into a small sandwich bag. Twist the top and then snip off one tiny corner. Use like a piping bag to drizzle chocolate over the bars. Return the bars to the fridge until the chocolate has set, then store in an airtight container, preferably in the fridge or freezer. Note: *To sprout raw, un-roasted buckwheat (not kasha), soak 2 cups of groats in three times the amount of fresh water for 12 to 18 hours, changing the slimy water once during this time. Then drain, rinse off any sliminess, and leave in a sprouting jar, mesh bag or sieve, loosely covered with a kitchen towel or cloth for a day or two, rinsing well twice a day. Once most of the grains have started sprouting (you will see a little tail forming), spread them all out on a tray or baking sheet and dry in a dehydrator or at a very low temperature (about 65°C) in the oven until crisp (usually this takes 12 to 24 hours). This low temperature is essential to preserve the enzymes in the sprouts, but if you are pressed for time, you could increase the temperature, thereby reducing the baking time.